In the beginning of 2014, it seemed as though Serbia's European path was sunny and irreversible. This was before Putin annexed the Crimea, invaded Eastern Ukraine and stated that the Balkans are a Russian sphere of influence. In December 2014, Serbia's European path has become cloudy, bumpy and not at all irreversible. In January last year has been given the long-awaited green light Serbia to begin accession negotiations as at the time the biggest hurdle was the enthronement of rule of law and then economic reforms. In the end of 2014, however, the implementation of the Brussels agreement for normalisation of the relations with Kosovo has turned into a precondition. And if that was more or less expected, in end-December has emerged another precondition - Serbia to break up with Russia. In this way, in 12 months, Serbia has transformed from a champion of enlargement into a geopolitical dilemma. The most frequently repeated mantra in Serbia last year was precisely the membership in the EU and that it is a strategic goal for the country. The government of Prime Minster Alexander Vucic undertook bold economic reforms which did not remain unnoticed in Brussels. He was unconvincing, however, in terms of other key conditions for membership like media freedom, rule of law, the independence of the judiciary, the fight against corruption and organised crime. But most of all the policy toward Russia. And a major role for that played the demonstrative intimacy with the Kremlin in October when a military parade took place on the occasion of the liberation of Belgrade from the Nazis with a special guest - Vladimir Putin. The message was more than clear. And in December Brussels stroke back. "The Council calls on Serbia to progressively align with EU Common Foreign and Security Policy in line with the Negotiating Framework". This is a very direct call on Serbia to introduce sanctions against Russia. And if this sentence from the General Affairs Council conclusions, which took place on December 16 in Brussels, allows for free interpretations, the statement of Latvia's Foreign Minister Edgars Rinkevics, whose country took over the rotating presidency of the EU Council, after the EU-Serbia Association Council left no doubt that the message is aimed at Russia. At the press conference after the meeting he said: "Serbia has once again reaffirmed its commitment to its strategic choice to the EU path. At the same time, there's a clear and increasing interest of the EU in Serbia's foreign policy moving toward the EU in a concrete role". The Association Council is the format where the negotiations between the EU and the candidate countries take place. At the first such Council last year the negotiating framework was agreed and Serbia expected and strongly hoped at the second one in December the first negotiating chapters to be opened. Moreover, Belgrade relied that the first chapters will be 23 and 24 because, according to the EU's new approach to the enlargement countries, these fundamental chapters that cover media freedom, independence of the judiciary, the fundamental human rights, the European values, the fight against corruption and organised crime, are opened in the beginning of the negotiations and are closed last. Practically, the opening of these chapters marks the very beginning of the negotiating process. In the late autumn of 2014, however, because of the confrontation between EU and Russia, the authorities in Belgrade lowered their expectations - if possible to open at least Chapter 32 which covers financial issues. The EU was relentless. Not only that no chapter was opened, but no date was set for that. "We're a little disappointed that we didn't get opening of the first chapters nor a date but this in no way will stop us. 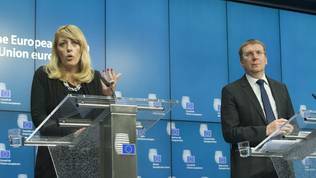 On the contrary, we will work even more", said Serbia's Minister of EU integration Jadranka Joksimovic. She said that Serbia got completely the European messages and understood them well. Asked by euinside whether this means that Serbia understands that it is expected to change its policies toward Russia, Ms Joksimovic said: "We, as a candidate, understand the importance of Chapter 31 and, of course, that we also know that we have to progressively align with all the conditions and standards. We are a candidate country and we haven't opened a single chapter yet, so it's also a realistic approach that it's not easy to be part of all decisions that you haven't been involved in". She added that it is very hard to implement all the European policies, not only because of the economic situation, when you are not part of the decision-making process. Practically, this means that Serbia puts a condition on the condition - it starts negotiations and then gradually gives up on Russia. Not before that. The Latvian foreign minister said, though, that there will be additional consultation with Serbia on Chapter 31 which will not be related to Russia only. Chapter 31 covers the European foreign, defence and security policy. The negotiations on chapters 23 and 24 will go in parallel to those on Chapter 35 which covers the normalisation of the relations with Kosovo. "Chapter 35 should be tackled early in and throughout the negotiations. This will provide a solid framework for monitoring implementation of agreements reached", is said in the decisions of the European and foreign affairs ministers. The Serbian reactions make it clear, however, that this could prove even harder than giving up the friendship with Russia. "We better be poor than lose Kosovo", said recently Serbian President Tomislav Nikolic. If the recognition of Kosovo emerges as a precondition for EU membership, this will be a clear signal that Brussels does not want Serbia to be a member and that the alignment with the Union's foreign policy will be a difficult task for Belgrade. "There is no church where we can pray for forgiveness for the introduction of sanctions against Russia because such a decision would be a catastrophe for us". the Serbian head of state added. 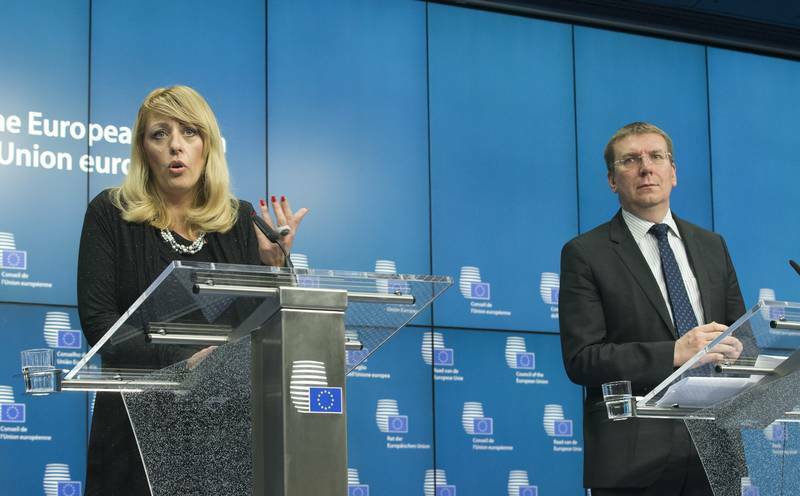 Jadranka Joksimovic said in Brussels that there are expectations the progress in the negotiations to be linked to the implementation of the Brussels agreement. "These are not easy questions but we expect the political dialogue to continue with the mediation of Ms Mogherini", she explained. The main speaker on the Kosovo issue in Serbia is precisely President Nikolic who almost daily finds and occasion to say that the implementation of the Brussels agreement is a two-way street. What should Serbia do if, for instance, Kosovo does not do its part, he often asks. 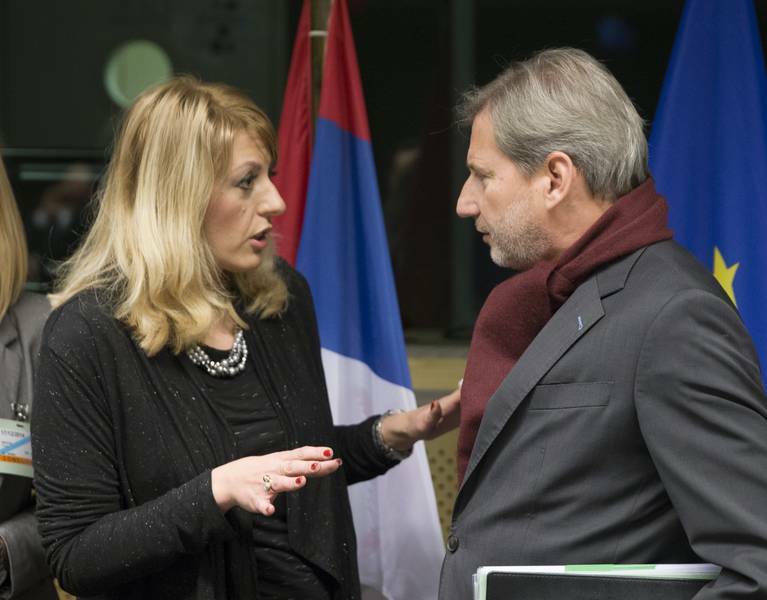 According to Ms Joksimovic, there is still no document on the basis of which to negotiate on Chapter 35. After the resumption of the political dialogue (January) consultation will begin to define what needs to be done to open Chapter 35 "because there are various interpretations", she added. 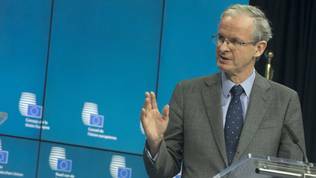 "The implementation of the Brussels agreement is what constitutes Chapter 35. There are no new conditions. What we want to see is more active implementation of the agreement", said Latvian Foreign Minister Rinkevics. 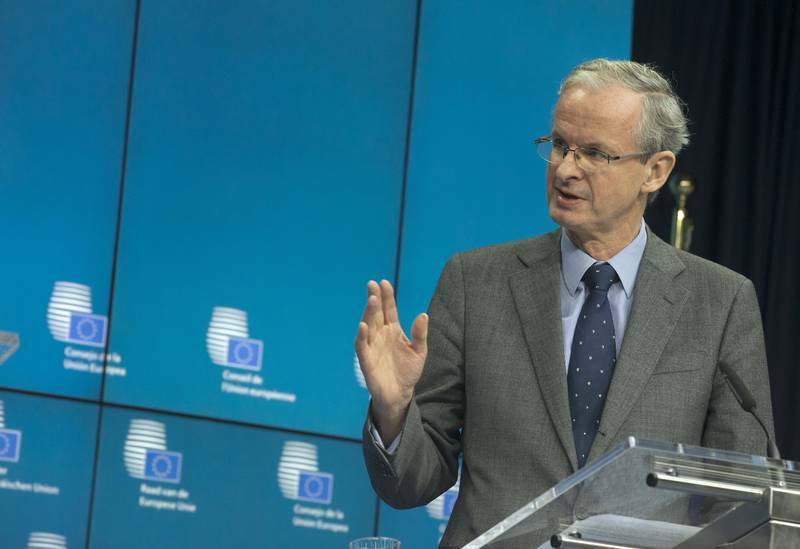 "It's very clear what needs to be done", added Christian Danielsson, director general for enlargement in the European Commission. Apart from the ghosts from its past, Serbia needs to fight also its present. This year begins the European Semester for the candidate countries. This means the country to conduct deep structural reforms, to cut spending and to fight the growing unemployment and public debt. In its report on enlargement in 2014, the Commission points out another thing that has turned into a fundamental for the enlargement - the media environment where Serbia scores a deterioration last year. Serbia cannot make progress without any of these elements but in order to be able to make any progress it needs to begin and to begin Serbia needs to be aware what is more important - the relations with Russia and Kosovo or the EU. This is a tough dilemma, undoubtedly, but it carries that significance the World War II had for Germany - reconciliation with the past. The choice of the European system of values does not mean losing Kosovo but quite the opposite - winning Kosovo back but with other means. After all, one day, if there is political will, both Serbia and Kosovo can be together in the EU. Then it would not matter what was before. EU is hypocritical towards Serbia. On one way EU countries stripped Serbia&apos;s legal sovereignty over the province of Kosovo 8 years after the war was over by illegal Albanian declaration. On the other way EU claims that Ukraine has the right for its sovereignty over Crimea. No wonder why Serbian nation sees this as one of expected double standards. Lastly EU has no interest in helping Serbia other then "legalizing" mess made with recognition of Kosovo. And if EU thinks to prolong membership to another 5-10 years these conditions are ridiculous and straight blackmailing. See you EU, you ain&apos;t worth our freedom. Tightening the conditions for EU entry, especially for post conflict societies of Western Balkans (at the time of geopolitical crisis), is a wrong move by Brussels, which is chasing these countries away from the West. Serbia feels abandoned by both European Union and Russia, despite trying to please both. The Ukrainian crisis was supposed to make Brussels reach out to Western Balkan states, not scare them off. Despite the toughest accession process in history of EU enlargement, Serbia and Montenegro still manage to remain on European path and lead their region. Brussels must not turn a blind eye on the Western Balkans, which is faced with pressure from both east and west and is in return not gaining any closer EU perspective. While these states are being punished for being week and succeptable to EU conditionality, another EU candidate - Turkey - is flirting with Russia, undermining Cyprus and not wanting to aid Syrians. EU must recognize the effort of Belgrade, Podgorica, and those regional capitals which are investing much into their alignment with Brussels. Serbia should be given an approximate EU entry date to stimulate it to continue its efforts, but also to convey hope to the rest of the Balkans to remain commited to reforms. Signing the Treaty of accession to the EU by 2020 would be not only possible, but also logical, as this country is in the last phase of accession to the Union. Serbia also needs a de-nazification, just like Germany needed that after WWII. There is no understanding of what Serbia did all over the Balkans during the wars of the 90&apos;s. Milosevic and his cruel massmurders are still seen as Serb patriots in big parts of the serb society, and there is no remorse for what they have done. Serbia is still seen as the victim not the perpetrator of these conflicts. For as long as that is the reality in Serbia, Serbia can not become a member of the EU. Serbia cannot join a club of neo-Nazis with the likes of Germany and Croatia who still haven&apos;t apologized for their horrific WW2 crimes against Serb civilians, not to mention what they did during WW1. We should of course trade and cooperate economically but politically Serbia cannot compromise its principles by following the neo-Nazi Germany and its rabid anti-democratic, anti-Serbian, anti-Russian politics. What about Vukovar my dear Serbian?